You couldn't ask for a better day to play miniature golf at Adventure Landing. It was a warm August morning without a cloud to be seen – a perfect time for some time outside. This was the type of day that brought up memories of summer vacations from school as a child, when the biggest problem was to figure out how to convince Mom to provide transportation somewhere fun. In other words, it was a great day to play Putt-Putt – or whatever it’s called these days. What you call it is a sign of your generation. Back in the 1960s and 1970s, there were Putt-Putts throughout the state of New York and in several locations around the country. Now they are in 12 states, mostly in the Sunbelt with none in New York. The courses go by other names, like mini-golf, but the basics remain. Kids of all ages love to putt-er around the course. Therefore, I enlisted a couple of youngsters, Owen and Ashley, and their parents, Matt and Melissa, to head to the course with me before school started. It’s no fun without a crowd. I’ll have a report on how the action went in a minute. But first, a history lesson. Miniature golf has been around in one form or another for more than 100 years. The game became really popular with a proper playing surface designed to provide a true roll was developed … only to see the business crash in the 1930s because of the depression. Miniature golf rebounded after World War II, with leisure time and disposable income reaching new peaks. The number of courses grew greatly, with plenty of silly attachments. There’s no formal recording of having a clown’s mouth serve as the last hole of a round, but it must have been in that span somewhere. Meanwhile, a man named Don Clayton in North Carolina had another idea. He thought miniature golf should be taken a little more seriously than most. He started franchising the idea for courses that were more skill-based than the others, without caves and clowns. The chain was called Putt-Putt. In hindsight, some Putt-Putt courses in the 1970s could have used some landscaping. This shot was taken in Syracuse in the mid-1970s. The operation probably peaked in the 1970s. There were Putt-Putts across the country, and something of a pro tour had developed. A syndicated television series ran on several stations including Buffalo, featuring – of all people – basketball analyst Billy Packer as an announcer. The show ran for a few decades in some places; you can find old videos at PuttPutt.com. A magazine subscription to Putt-Putt World cost something like $2.50 for four quarterly issues. A bargain. My high school friends found Putt-Putt a cheap way to have competitive entertainment. Buffalo had two outlets – one on Union Road in Cheektowaga and the other on Sheridan Drive in Amherst. 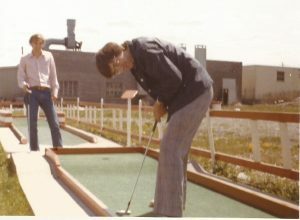 We claimed a 30-cent discount ticket when we scored a hole-in-one with the proper colored ball (it alternated), which wasn’t much of a saving even then. There was fun to be had in unexpected ways. One time, a course featured a 17th hole with a ramp just off the tee. The idea was to get the ball flying over the water hazard and on to the green just beyond it. One time, my friend Glenn hit the ball too hard and it started bouncing. In fact, it bounced over the board at the end of the hole and rolled over the concrete on to the 18th hole – where, almost unbelievably, it went up a hill and into the cup. The debate immediately started whether he was lying two (one-shot penalty for going out of bounds) on No. 17, or had a total of score of one for the two holes combined. There’s never a USGA rules official around when you need one. Another time, I turned my ankle on the edge of the cement that supported the holes. As I rolled on the ground in pain, one friend wasn’t impressed. “You can’t sprain your ankle playing Putt-Putt!” he maintained. Another replied, “Oh no, I’ve done something like that. That really hurts.” I think I convinced the pair eventually to stop arguing and get me some ice. Eventually, Putt-Putt franchises fell away from the Buffalo sporting scene and several other locations. I wonder if the real estate simply became too expensive. But miniature golf still exists throughout the country. If you ever visit Myrtle Beach, South Carolina, you’ll see proof. It must be the world capital for the activity. Meanwhile, the course on Sheridan Drive is still open for business, although in a slightly different form. I headed to Adventure Landing with some fears that the courses would be a lot sillier than they used to be, with slides and animals all about. But, happily for the purist in me, it still looked like the old Putt-Putt in a lot of ways. Every hole still was a par-2, making it a par-36 for the course. Most of the designs of the holes hadn’t changed much. Some circular concrete blocks had been replaced by tree stumps, for example, but actual play hadn’t really been altered. The biggest difference might be that the old layout featured three courses, while the new one had two. The updated layout had a waterfall and some other landscaping to take up the room. The price, naturally, was different than it was in 1974, when you could buy three games for $2.50 or so. Here it was $7.50 for one round, $8.50 for two. 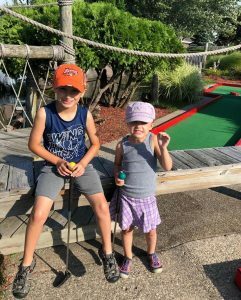 Owen and Ashley are at rest for a change during a round of miniature golf. It was five-year-old Ashley’s first time on the links, and golf was a foreign language to her. She had some grips and stances that would have made a tradionalist cry, and she didn’t exactly follow the rules when they weren’t convenient. Who cares? It was interesting though that the left-handed Ashley first tried to putt left-handed, but struggled. Then she tried it in the right-handed style, and had more success. A switch-hitter is born. Meanwhile, Owen’s swing looked more like it was borrowed from hockey, as it swept the ball along. At one point, when the ball was rolling back down a hill, the seven-year-old simply stopped it and got ready to play his next shot. Heck, Phil Mickelson did that in a tournament recently, so there’s no shame there. Even so, I am happy to report that there were only a couple of temper tantrums by the kids during the course of the round. The parents were happy about that. And we managed to keep them from spending the rest of their family’s yearly salary in the adjoining arcade, which was a big victory in of itself. 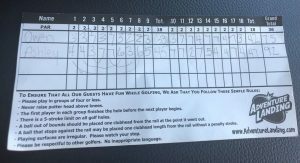 As for the adults, I was happy to shoot a 2-over 38 in my first round on the Sheridan Drive course in about 30 years. It wasn’t good enough to beat Matt, who had a few aces on his way to a sparkling even-par 36 and bragging rights forever over me. We wisely installed a seven-stroke limit for the round, even though there wasn’t much of a bag line behind us. It kept the kids’ scores in double digits. Everyone had a fun time, which is what we needed on the hot summer day. That part of miniature golf remains timeless. The scores will get better in the years ahead as Owen (who officially shot a 75) and Ashley (92) get more practice.